I’ve rediscovered my enthusiasm for the stained glass of Morris & Company after visiting Christ Church in Southgate, North London. The windows in this church cover every period of the firm’s production from 1861 until the twentieth century, with designs by William Morris, Dante Gabriel Rosetti, Ford Madox Brown, Philip Webb and Edward Burne-Jones. The photos I’d seen were mainly those rare early windows designed, made and painted by the partners in the original firm, in the Victorian Medieval style i.e small figures engulfed by patterned borders and backgrounds. But the ones I really liked are shown in the photo below. There are pairs of figures in all the windows of the north and south aisle, they look great from a distance because of this consistency of design and are full of amazing detail and colour. Burne-Jones designed all except the figure of St. Francis which is the latest and is by Henry Dearle (1911). The next two pairs of windows were made earlier, the figures of Temperentia and Caritas are flowing and curvy, with a pair of astonishing babies, shown below left. The earliest two, Spes and Fides are plainer, calmer and they let in a lot more light. South Aisle, left to right: Patientia & Pax (1909), Martha & Phebe (1903), King David & St Francis (1911), St Peter & St Paul (1865). The figures on the south side are all much darker, particularly the matching backgrounds. Below are details of two of the figures, with beautifully painted faces, hands and clothes. In the set of windows in this church the faces are all different and quite mesmerising. At the end of the row (above right) are earlier windows of Saints Peter and Paul with wildly patterned surrounds, they are figures familiar to me from other Morris & Co windows. Left: The figure of Patientia. Right: The figure of Martha. The other pair of windows that show the designs of EBJ at his flowing best are high up on the north wall of the chancel, apparently the first ones where he used photographic enlargement of drawings to prepare the stained glass cartoons. All in lovely light colours and with a great detail of a rip over the knee of the ragged girl (below right) visible even from a distance. North chancel: Left, Dorcas. Right, The Good Samaritan (1876). The Church of St. Martin's, Low Marple, near Stockport, was designed and built in 1869 -70 by the Arts and Crafts architect, John Dando Sedding. 'The Firm' (Morris, Marshall, Faulkner & Co.) made three windows for the church; the east window (above), includes figures designed by Burne-Jones, William Morris, Ford Madox Brown and Dante Gabriel Rossetti. Visitors come specially to look at this example of a faulty and unrestored window by the firm. As with many windows from this period by a number of stained glass companies, the paintwork quickly deteriorated - came off, not faded as the guidebooks incorrectly say. This defect, caused by using borax in the paint, was something that William Morris corrected by repainting and firing much of the glass in the firm's early windows, but not this one. Here, the appearance of the mostly unpainted glass, with details and patterns removed, reveals the overall design of the window in quite an appealing way. You can learn a lot about stained glass techniques from this window. As you can see in the detail (above right), the silverstain (transparent gold colour) is still there in WM's familiar self portrait as St. Peter although most of the opaque black lines have gone. The comparison with the same figure from Beaudesert also helps. Since I've started looking at stained glass by Morris & Co. I've had a lot of fun spotting the reappearance of figures throughout their works in tapestry and embroidery as well as stained glass. In this church I found a fourth version of Burne-Jone's Mary, with its paintwork almost intact. Marys left to right: St. Martin's Low Marple 1873, St. Nicholas Beaudesert 1865, St. Mary's Sopworth 1873, St. Martin-on-the-Hill Scarborough 1868. Christopher Whall at Low Marple: The Lady Chapel added in 1895, South West Window 1899, West Window 1892. The church is also notable for slightly later works by Christopher Whall. The Lady Chapel, with an eccentric 3D ceiling and an altar painting of The Annunciation, is worth going to see. And in his beautiful West Window is a character I had seen and admired recently in Leicester Cathedral (below). It is interesting to compare the differences in colour, background pattern and detail in the two versions of essentially the same figure. I generally identify the stained glass of Christopher Whall by the way he paints people's facial features. The faces of the angels in the great East Window in Leicester Cathedral are typical. When you zoom in on the little people in the boat in the otherwise untypical Whall South West window at Low Marple (below) you can tell that this window is one of his. 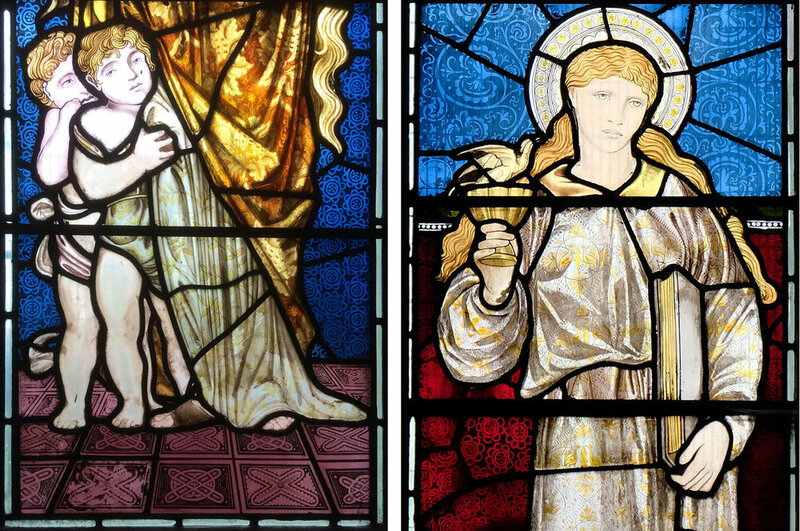 I have seen three Morris & Co. windows recently that use the same Burne-Jones cartoon for the figure of the Virgin Mary, in the centre above, and I've written about two other versions, below, in previous posts. This post is called "The Four Marys" in honour of the strip cartoon from "Bunty" magazine and for the other Marys alongside the Virgin Mary: Mary of Bethany at Scarborough, Mary of Cleopas at Sopworth and Mary Magdalene in both churches. However, I find that I am not particularly interested in the iconography, or the stories that the guidebooks to the churches tell about the artists, possible models and local patrons involved. What I look at is the way that the figures have been inserted into the window shapes and how they contrast with the backgrounds used in each case: richly coloured and geometric at Scarborough, small figures in quite a basic scheme at Beaudesert, popping out of the lancets but with a more sophisticated organisation of the background at Sopworth. Below, in ascending order of preference, are three shuffled Virgin Marys. What a difference the colour contrasts and patterns used for furnishings and fabrics make to the very same figure whose clothes and lily can be made to join perfectly. The dark iron oxide paint on the later version has lasted much better than the paint recipe that the firm used in its early years. Visiting churches with windows made by the firm of Morris, Marshall, Faulkner & Company, and after 1874 by Morris & Company, throws up familiar figures. In St Helen's Church, Welton (about ten miles west of Hull) there are five Morris & Co. windows with figures mostly designed by Edward Burne-Jones who had a local family connection. The large west window has beautiful roundels above and King Ethelbert on the right who I immediately recognised from a recent trip to Malmesbury Abbey , initially by his magnificent leggings. The St. Nicholas at Welton (below centre) was familiar to me from his facial features: when you look at the earlier window at Beaudesert you see a different portrait of the same figure. I find the background details particularly interesting - ways of depicting underfoot plants, borders and backgrounds. I love the illusionistic dark blue curtains on poles behind the Welton figures - this photo of Mary comes with a real decaying tassel and cobweb in front of the window. In the same church I stood enthralled in front of St. Catherine, thinking how great the combination of book, sword and beautiful green dress was. Nothing interesting in the background to distract you here. The fun part of window spotting is remembering where you've seen someone before, and this St. Catherine is also on an embroidered brown velvet curtain at Kelmscott Manor, it is one of my favourite items there. I checked by putting the embroidered face on top of the stained glass one that the details are no different, only the size and the colour. Although I am reluctant to believe the guides, all the ones I have consulted attribute this figure to William Morris who supposedly couldn't do people. St Nicholas Beaudesert, Henley-in-Arden, the church in a place with a beautiful name and a hideous sign almost wrecking the Twelfth Century entrance. Inside I found other themes that appear every time I go to a church with windows designed by William Morris and his partners. For instance, is the curly haired, bearded St. Peter (below left) one of those figures that is based on a portrait of WM? I'd seen Burne Jones' figure of the Virgin Mary in the north west window at Beaudesert before; she is in the window of the three Marys at St. Mary's Sopworth, and there is an earlier version of the same figure in Bradford Cathedral. It's not my photography, some of the paint has gone (borax problem) from the Beaudesert glass and because it is about half the size of the Sopworth Mary the details look less fine when comparing the images at the same size. Then there are some more fine shoes for the stained glass shoes collection, these are on Saints Paul and George. A graphic version of what I call "the clump" makes a lovely repeat ground for all these figures to stand on. And there are angels wearing feathers and standing on wheels, which I have learnt puts them in the third ranking order of angels.